Download music, PDFs, software, and other items by clicking links on webpages. Important: If a download contains software, an alert appears when you open the item. To be safe, don’t open it if you weren’t expecting a software program or if it’s not from a trusted source. In the Safari app on your Mac, click anything identified as a download link, or Control-click an image or other object on the page. Safari decompresses files such as .zip files after it downloads them. Note: If you download an item that you previously downloaded, Safari removes the older duplicate so it doesn’t take up space on your Mac. See Optimize storage space on your Mac. In the Safari app on your Mac, click the Show Downloads button near the top-right corner of the Safari window. The button isn’t shown if the downloads list is empty. Pause a download: Click the Stop button to the right of the filename in the downloads list. To resume, click the Resume button . Find a downloaded item on your Mac: Click the magnifying glass next to the filename in the downloads list. If you move a file or change the download location after downloading it, Safari can’t find the file. 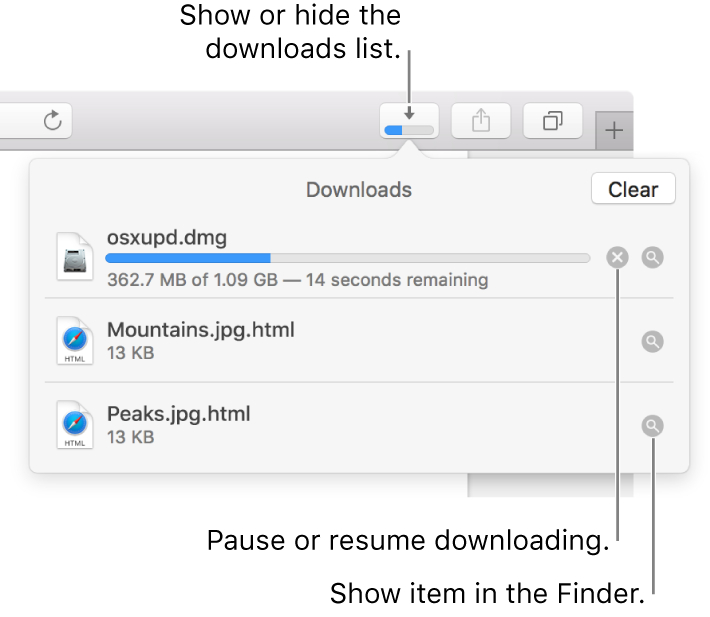 Tip: To change where downloaded items are saved on your Mac, choose Safari > Preferences, click General, then click the “File download location” pop-up menu and choose a location. Clear the downloads list: In the downloads list, click Clear. To remove one item, Control-click it, then choose Remove From List. By default, Safari automatically removes an item after one day. To change when items are automatically removed, choose Safari > Preferences, click General, then click the “Remove download list items” pop-up menu and choose an option.